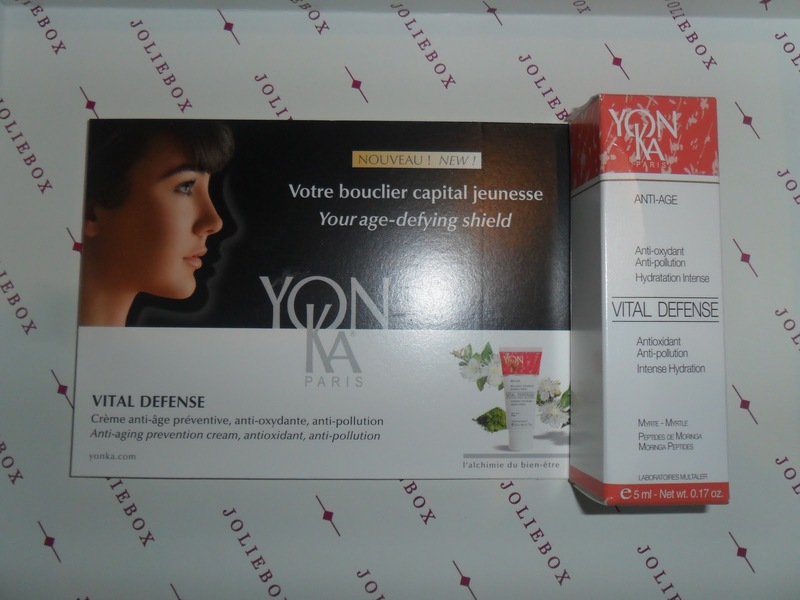 "Yon-Ka - Vital Defence (5ml) - Anti ageing prevention and anti-pollution cream to help the skin to preserve it's youthfulness." 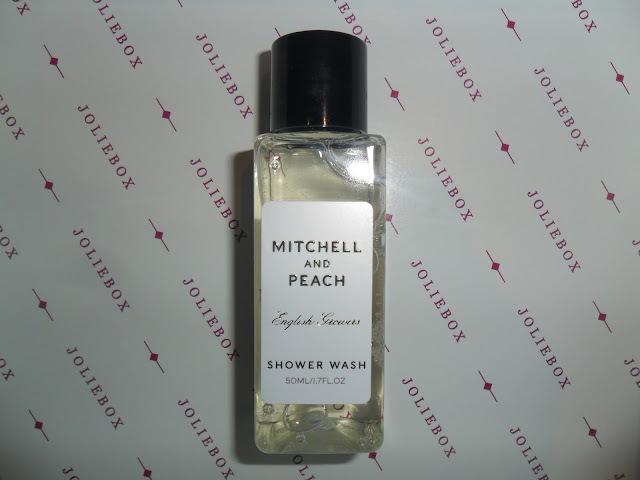 "Mitchell And Peach - Shower Wash (50ml) - An invigorating shower wash containing natural English honey, vitamin E and wheat proteins." "New CID Cosmetics - i-gloss (fill sized) - Light up lip gloss with mirror for a non sticky, long lasting and high-glam shine." This will be interesting to try as I am not usually a lip gloss kind of girl but who would want this in their handbag on a night out. I know this has been in other beauty boxes and I took a look at the range of colours and this is the one I would have picked - Coconut Ice. "OPI - Gold Shatter Nail Laquer (full sized) - Apply over any dry nail laquer to create a stunning shattered effect." Well if you read my blog regularly you will know OPI is my fave nail polish brand I have never tried the gold shatter but i love the black shatter so this is a very welcome full sized treat. "Jane Iredale - 24-Karat Gold Dust (full sized) - A multi-use shimmer powder in shade Rose Gold to apply to cheeks, eyes, lips, body and even hair." This is a lovely shade, i'm not too sure about putting it in my hair though. "Kusmi - Detox Tea (20g) - A delicious blend of Mate, chinese Green Tea and lemon grass full flavoured with lemon." 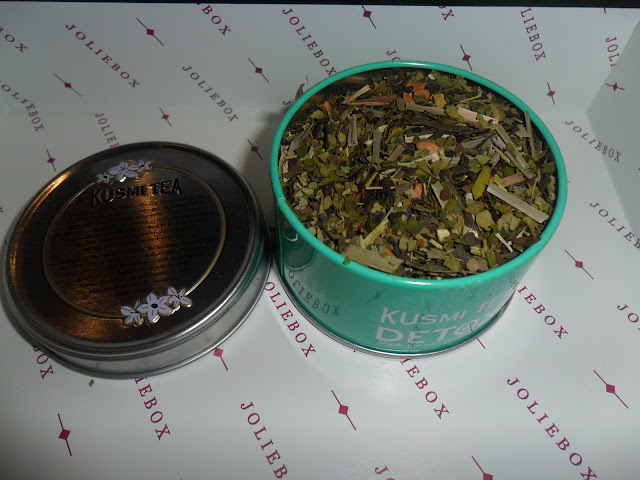 I am a huge herbal tea lover so trying out new brands is great, I also got a voucher inside the box for 15% off any purchase at www.kusmitea.com and a free tin with any purchase. 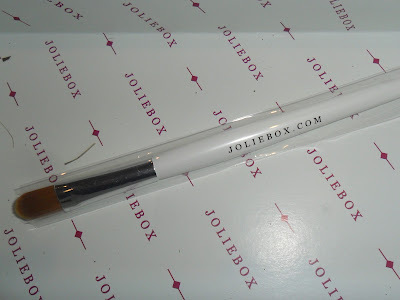 "Joliebox - Concealer Brush - Designed for blending concealer, the pointed tip provides precision for small imperfections whilst the flat side smooths coverage across larger areas such as under the eye." I don't own a concealer brush.....Now I do! Also inside was a card about a website that I have never heard of http://www.wishwantwear.com/ which is a designer dress and accessories rental (they call it borrow) delivered straight to your door, I have had a quick browse at the website and it looks lovely, so if you haven't got your Christmas or new years outfit sorted yet and want to WOW people take a peek. I will definitely be keeping my subscription to see what is in the next box and see if they can keep up the good work! 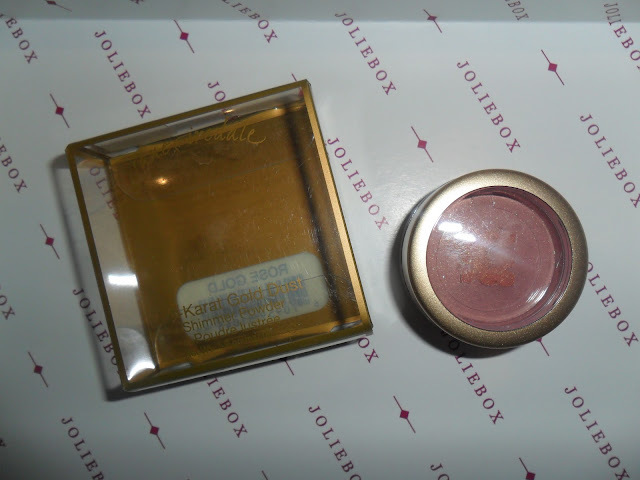 So what do you think of the new Joliebox? @ Pretty in Pink - haha, that made me giggle, it's very pretty isn't it. i can work with it! DAMMIT I WANT MY BOX! i was hoping it would come today, i wont be able to pick it up before christmas now as im going home! @ Pretty in Pink - aaawww what a shame! Has your postmas been today? Mine turns up between 12 and 3pm but he was early today, he must have known I was waiting for this! Wow, it looks great, I'm close to unsubscribing them but if they keep to a standard like that I might be staying. I hope we'll get more brushes as time goes on, would be nice to get a set. @ Elanor - Good thinking hun, I didn't even think about getting more brushes but that would be fab! I subscribe to Glossybox, FeelUnique, Amarya, Carmine and Joliebox, and I think this is the best looking box I have seen to date. I've worked out the value of the contents (based on price per gram for sample size items, and full retail price for full-size items) at nearly £50 - the full-size shower gel (250mm) retails at £20, certainly something I would never have bought on the off-chance I might like it, but I'm more than happy to sample it like this. I really hope I got the same bits as you in my box! 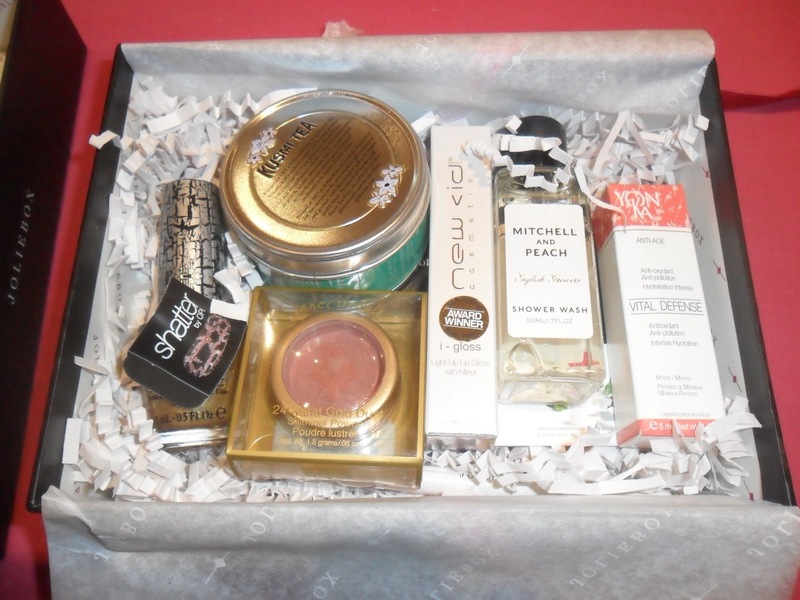 I seemed to get the duff Glossybox this month, with some unwearable blush/shadow colours and a tiny, teeny, weeny pot of eye cream that stank of sour milk. When I complained to Glossybox about the smell, they told me it wasn't unpleasant. It bloody well was! @ Annie - Wow, well done you for working out the contents I got too excited!ha! I have never tried glossybox but would like to. I wouldn't like a pot of 'sour milk' though yuk!! @ Celia - I know what you mean hun. This box is fab but I am not sure how many 'variations' there is of it. I have wanted to sign up to Glossybox but there is too many 'you might get this...or this....or this' if you know what I mean. full size OPI, amazing! and the tea is a brilliant idea too! I only get the feel unique box at the moment, but this looks like a contender! 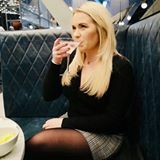 Wow great review, I've been wanting to try it ever since they changed and you've definitely now convinced me :) Now following! An Easy Festive Nail Art Design Tutorial. Mini 17 Haul - Boots Go Makeup Gift Crazy! What Do You Do With Your Beauty Box Rejects?